The Yao Mun began migrating from China 200 years ago. There are now about 10,000 of them living in Laos, particularly in the north along the Chinese and Burmese borders. Others migrated to Vietnam, and some are still living in China. The Yao Mun are known as Lanten, from Landian in Chinese which means “Indigo Yao”. They are also referred to as the Lao Huay, which means “Lao of the streams”. The Yao Mun believe in Taoism, and use Chinese characters for their written language. The Lanten are known for upholding their culture and traditional dress. Lanten women wear hand-woven, dark blue indigo-dyed tunics with a pink tassel on the chest and short trousers. Men wear a simple indigo dyed jacket and trousers. Their clothing is made from hand-spun, hand-woven cotton, and indigo bushes are grown by each family. Traditionally, young Yao Mun women pluck their eyebrows and comb their hair away from their forehead in a way that is very unique and different from other groups. 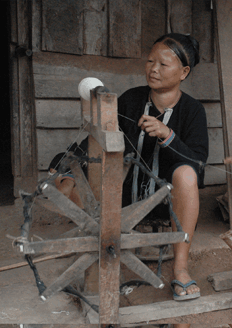 Women also make very thin paper from bamboo shoots. The paper is used in the practice of Taoism.